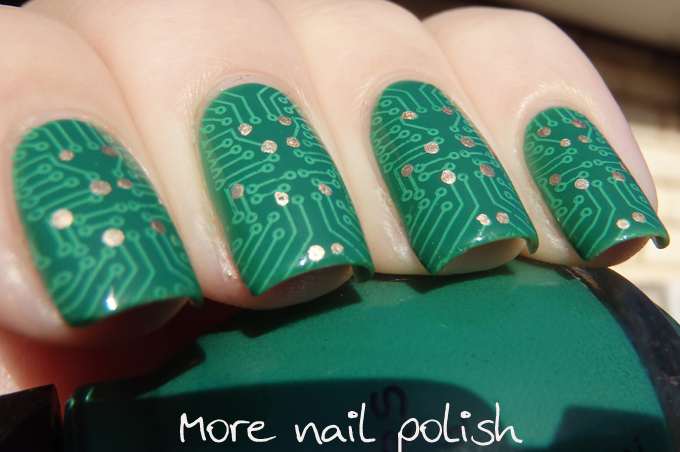 Here is another mani that I was waiting to get my Mundo de Unas stamping polishes to create. I really with this stamping design from Bundle Monster plate BM415. 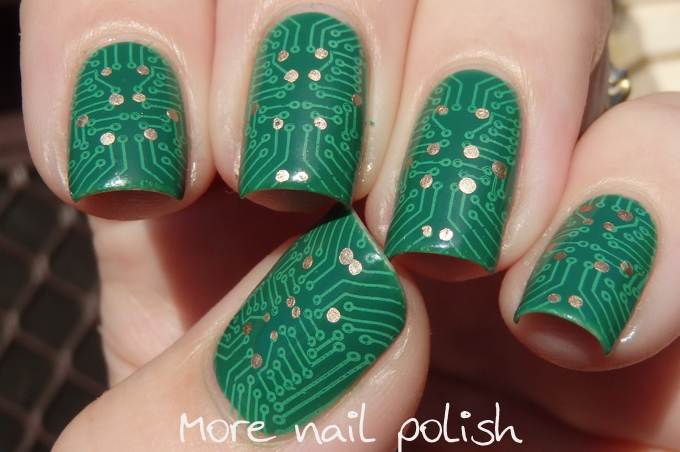 Other than being a really cool and geeky design to put on your nails, this design had special memories for me. Way back in 2012 I had a giveaway on my blog for a Salon Express Nail Stamping Kit. 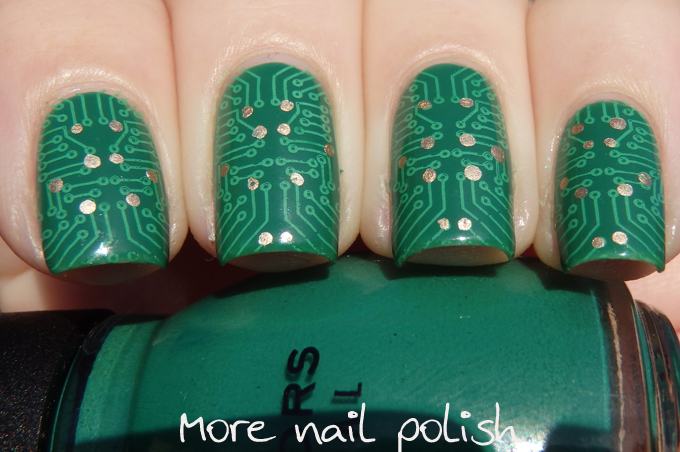 They way I chose the winners was to ask them to complete this sentence - "If I could design my very on nail art stamping image plate, I would put on it ...."
One of the winners I selected - who turned out to be fellow Aussie nail blogger Rebecca from Polished Peripherals responded with circuit board. Whoever submitted this design to Bundle Monster for the create your own set did a great just with the design. Now back to the mani. I didn't have any green polishes that were the right colour and that could stamp well, in fact I'm sure I didn't have any green stamping polishes until I got the Mundo de Unas ones. The base for this mani is Sinful Colours Envy and the stamping polish is actually a mix of Mundo Green, with a tiny bit of black to grey out the brightness and then white added to lighten the shade. I added a few 'solder' dots using Essie Good as Gold and a dotting tool. so geeky ! love it ! I actually have a green polish that ressembles the one you used. What a great idea ! 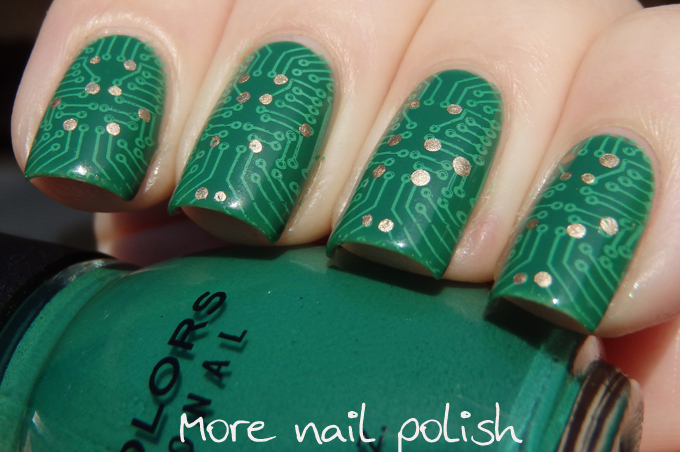 nice nailart! and the color is just amazing!